Since I got back from Holiday Health Club at No.1 Hit Bootcamp, I’ve been making a conscious effort to eat healthy. After having a couple of nutrition chats and a lot of pain, Bootcamp really taught me a lot more than I realised. I’ve found myself thinking more about what I put in my mouth and actively increasing my water take. Where I used to fill up on countless cups of tea, I now try to keep a big bottle of water on my desk – and I’ve been drinking around a litre and a half to two litres a day – a lot more than I had been! And I’ve noticed a huge difference in not only my skin and hunger, but also on my energy levels. I’ve also been actively trying to increase the amount of protein I’m eating because I realised I really wasn’t getting enough. 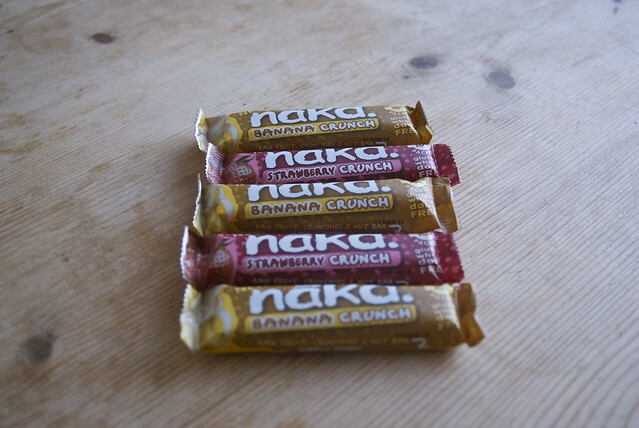 So when Natural Balance Foods got in touch and asked me to try out their Nakd Crunch Fruit Bars, I jumped at the chance. With me being away on holiday this weekend, I’ve spent the past couple of weeks trying to cut back on my chocolate in take and opting for fruit instead. I’m already a big fruit eater, but after being sent these bars, I substituted a couple a week for my treat time. Packed with fruit and soya crunchies, the bars are dairy, wheat and gluten free, and are a great source of protein (although contain surprisingly more calories for the size of them at 108 a pop). But being made with 100% natural ingredients and being low in saturated fats, they’re a great substitute to just filling your face with maltesers and kinder eggs.. After being sent a huge box with a selection of strawberry, banana, apple and cocoa flavour bars, I decided to share them with everyone in my house. Not even a week later and the above image is all that remains. I think it’s safe to say the cocoa (which I didn’t actually get a chance to try!) and the apple ones were the favourites in my house!